The MBM DestroyIt 2270 Strip Cut Shredder features two separate cutting heads with separate feed openings - one for paper and one for CDs. This paper shredder offers a window in its removable shred bin that shows the amount of shreds collected. The Destroyit 2270 also offers an integrated collection tray in shred bin keeps plastic shreds separate from paper, an automatic start and stop controlled by photo cell and a single, multifunction control switch with pilot light for stand-by, stop (off), and reverse. The MBM DestroyIt 2270 also includes a transparent safety shield in the feed opening, high quality, hardened steel cutting shafts take staples, paper clips, credit cards, and CDs. This allows MBM to offer a lifetime warranty on the cutting shafts. The MBM Destroyit 2270 also features a quiet and powerful single phase motor, double protection against overheating and durable gears enclosed in dust-proof housing. It includes a high quality wooden cabinet, automatic power cut-off when shred bin is removed from cabinet, a 5 gallon shred volume for paper and 3/4 gallon shred volume (approximate) for CDs. All of these things make the Destroyit 2270 ideal for deskside/personal shredding use. Dimensions (D x W x H): 8 3/4" x 13 1/2" x 21"
MBM Corporation presents the DestroyIt 2270 Deskside Model Business Shredder with automatic function, a separate cutting mechanism for CDs and DVDs and an 8 ? inch feed opening. The quiet, energy-efficient 1/5 hp motor provides a shred capacity of up to 12 sheets in the strip-cut version and up to 6 sheets in the cross-cut. Our precision cutting shafts are constructed entirely of high-grade hardened steel and are backed by a lifetime warranty. Safety features include a transparent safety shield in the feed opening. The high-quality plastic shred bin has a 5-gallon shred volume. It also features an inspection window showing the fill level and a second collection tray to keep plastic shreds separate from paper. DestroyIt - Quality Made in Germany. MBM Destroyit is known for delivering high quality products and their 2270 Cross Cut Shredder is no exception. This personal device features easy operation and swift shredding while separate openings for paper and plastic items facilitate simple recycling. 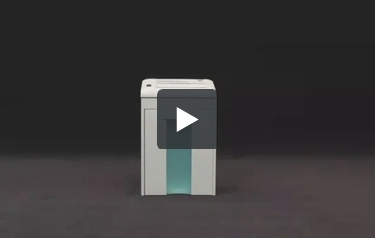 These along with other beneficial design features provide convenient and efficient shredding. Let's take a closer look at MBM's 2270. The petite dimensions of this shredder allow it to store easily next to a desk for quick access. Depending on the height, it could possibly store under a table, although that may make it awkward to insert items. But it only weighs about 32 pounds, so moving it around to find the perfect location shouldn't be too much of a hassle. A single, multifunction switch controls standby, stop (off), and reverse functions. Each operation is indicated by a backlit icon to keep the user updated. As materials slide into the feed, a photo cell sensor turns the blades on and off as needed. The automatic off also activates when the bin is removed. The powerful single phase motor is double protected from overheating, prolonging the life of the engine and preventing burnout. Durable gears are housed in a dust-proof enclosure to cut down on wear and increase service life. A clear safety shield guards the 8.75 inch opening from fingers and other objects getting caught in the blades. Up to six sheets can shred at once, going through as fast as 12 feet per minute. The plastic slot accommodates credit cards, CDs, and DVDs. Materials come out in small particles only 1/8" by 1" in size and provide a level 3 security rating. This is excellent for generic office shredding as well as most confidential information. Shred Speed 12 ft./min. 12 ft./min. 27 ft./min. 14 ft./min. 14 ft./min. 27 ft./min. 27 ft./min. Feed Opening 8 3/4" 8 3/4" 9 1/2" 9 1/2" 9 1/2" 9 1/2" 9 1/2"
Dimensions (D x W x H) 8 3/4" x 13 1/2" x 21" 8 3/4" x 13 1/2" x 21" 11 3/4" x 15 1/2" x 28 3/4" 11 3/4" x 15 1/2" x 28 3/4" 11 3/4" x 15 1/2" x 28 3/4" 11.5" x 15.5" x 25" 11.5" x 15.5" x 25"
Does this product require oiling and if so can I order the oil when I order the machine? What, if any, is the name of the oil? Thank you for your question. The MBM Destroyit 2270 Cross Cut Paper Shredder does require periodic oiling. MBM Destroyit shredder oil comes in a variety of sizes and quantities, you can find our selection here .